The Chinese are reportedly considering building a railway between China and Nepal that could involve building a tunnel under Mount Everest. The plan has set alarm bells ringing in Delhi. The proposed 540-kilometer high-speed rail link is expected to be completed by 2020 and would be an extension of a railway that already links China with Lhasa, the capital of the Tibet Autonomous Region, according to Chinese state media. 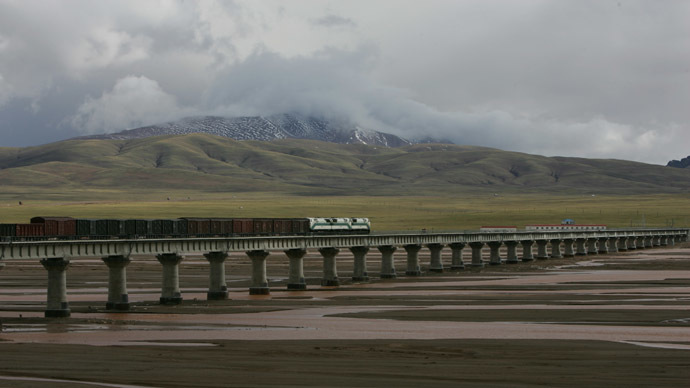 “A proposed extension of the Qinghai-Tibet Railway to the China-Nepal border through Tibet would boost bilateral trade and tourism as there is currently no rail line linking the two countries,” the state-run China Daily reported. However, because of the huge changes in elevation along the route, trains would probably be limited to a maximum speed of 120 kilometers per hour. A rail expert at the Chinese Academy of Engineering, Wang Mengshu, said that engineers would face a number of challenges. “The changes in the elevation along the line are remarkable. The line will probably have to go through Qomolangma [Tibetan name for Mt Everest] so workers may have to dig some very long tunnels,” Wang said. According to Wang, the project is being built at Nepal’s request and China has already started preparatory work on the Chinese side. The Chairman of the Tibet Autonomous Region, Losang Jamcan, told Ram Baran Yadav, the President of Nepal, on a visit to Lhasa last month that China will extend the existing Tibet railway to Kermug, the Chinese town nearest to the border with Nepal. It was reported last July by the People’s Daily newspaper that China also plans to extend the Tibet railway to the borders of India and Bhutan. An extension also opened last year from Lhasa to Shigatse, also in Tibet, the traditional seat of the Panchen Lama, a Tibetan spiritual leader. The People’s Daily also reported that China would build two more rail lines from Shigatse, one to Yadong, near the border with India and Bhutan and another to Jilong, near the border with Nepal. Beijing has been investing billions of dollars into the poor Himalayan nation, building roads, hydroelectric power plants and telecommunications. Chinese tourism to Nepal is also on the up and Beijing also recently increased its annual aid to Nepal from $24 million to $128 million. READ MORE: India warms up to Nepal – is China feeling the heat? India may not be too pleased at the developments, as it regards Nepal as within its sphere of influence. There is alarm in New Delhi that China’s increasing role in the affairs of Nepal, Pakistan, the Maldives and Sri Lanka is a deliberate strategy to encircle India. But Hu Shisheng, director of the China Institute of Contemporary International Relations, told Chinese state media that the aim of investing in the railway is to improve people’s livelihoods and local economies. “The Chinese government’s claim that rail expansion on the plateau simply benefits tourism and lifts Tibetans out of poverty does not hold up to scrutiny and cannot be taken at face value,” ICT president Matteo Mecacci said in a statement.